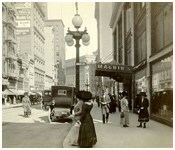 I. Magnin & Company was a San Francisco, California-based, high fashion and specialty goods luxury department store. Mary Ann Magnin founded the company in 1876 and named the chain after her husband, Isaac. The chain’s flagship San Francisco store was located next to Macy&rsquo;s California flagship on Union Square. In 1944, the chain was bought by the Los Angeles-based Bullock’s department store chain.